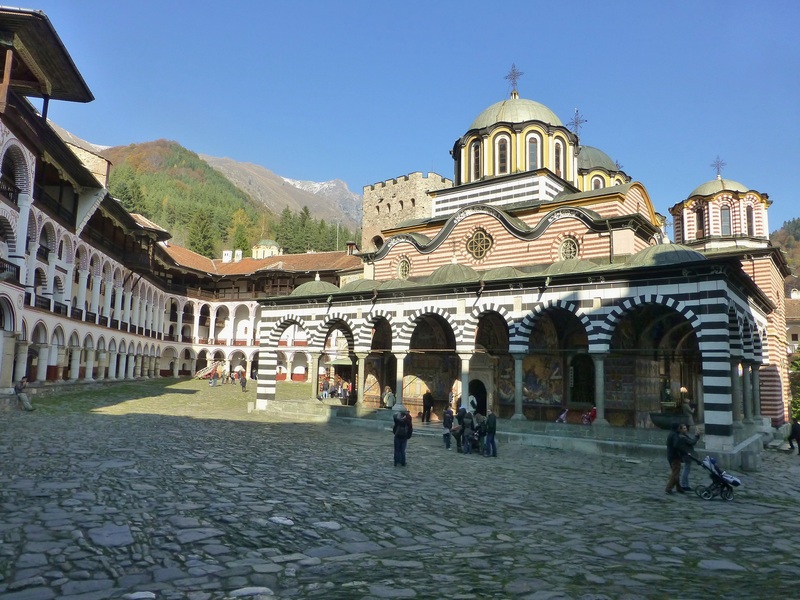 The Rila Monastery, founded in the 10th century, is one of the most popular tourist sights in Bulgaria. Nice place for a hermit. I spent little time in the church itself. Monks covered the exterior walls in bright frescoes depicting saints, the life of Christ, heaven, hell, demons torturing the sinful, etc. All that good stuff. Like most things in Bulgaria, reaching the monastery is a worthwhile pain. It’s easiest to go from Sofia. Catching a bus from there, the driver looked as though a passenger boarded, then decided to drive the bus. Sporting a v-neck t-shirt with an American flag emblazoned across his chest, calling his pals as we barreled down (nominally maintained) country roads, my confidence in him was assured. He seemed legit. Were I fated to die, the headline in the paper would be memorable, at least. We zipped onward, passing through small villages with terracotta roofs and horse-drawn carts. Sofia has a jankier feel than most European capitals (more broken sidewalks, aging buildings, a general vibe that politicians prefer to steal from the public more than the average politician), but the countryside shows the pace of economic development. Whereas the United States has a GNI per capita of about $53,000, and the Czech Republic about $19,000, Bulgaria’s GNI per capita is about $7,300 (World Bank, 2013). Throughout Bulgaria, monasteries tucked away in mountains preserved the Bulgarian cultural identity and language throughout five centuries of Ottoman rule. The mountains and seclusion didn’t stop the Ottomans from destroying a monastery or two, but they were usually rebuilt. The monastery’s library and museum have preserved much of its cultural output. The drive from Rila village to the monastery gets beautiful quickly (enjoy the squat toilet at the bus station before heading to the monastery!). Hills become mountains, trees burst with color, boulders jut out through the earth, and a stream runs alongside the road. It’s unclear a monastery is near until signs in Cyrillic and English advertise guest houses and small hotels. Some perks for visiting during a chilly November. The monastery was crowded, though everywhere else in the country felt empty. For 30 lev ($20), the monastery offers guest rooms (no wi-fi). A 4-kilometer trail from the monastery leads to a church and the grave of the hermit founder, Ivan Rilski. Another trail, twice as long, leads to Kiril’s Meadow; views there are supposed to be fantastic. Without renting a car or staying the night, however, bus schedules leave little time to do much beyond touring the monastery grounds and eating at the nearby restaurant. With another American and a new Polish friend, we left the monastery for a hike. 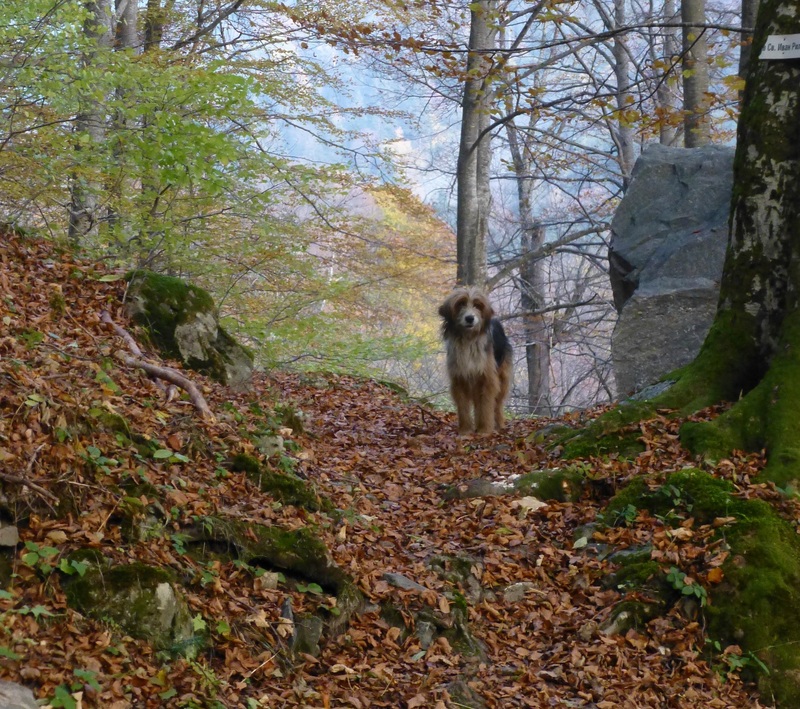 As is the norm in Bulgaria, the monastery has its own stray dog population. One adopted us and guided our hike. It’s worth staying overnight for the smaller crowd and the time to hike around the area. The mountains are colder than the rest of the country, so dress the part. Before the hike, we ate a late lunch at the restaurant. Returning late, a nearby hotel had the only open restaurant. Taking our order for dinner was the waiter who took it at lunch. I’m not sure what kind of racket he was running, but the food was good enough to ignore this shady micro-monopoly.